We all know donor retention is important to the long-term health of a nonprofit. Software Advice, a company that helps all kinds of organizations find the right nonprofit software, wanted to find out what nonprofits can do to turn one-time donors into repeat donors. To get some answers, Software Advice surveyed 2,833 American adults on how they want organizations to engage them following a donation. They were able to gather some valuable, actionable data on how to follow up with donors and motivate them to give again. Once a donor decides to make their first gift to a nonprofit, most organizations will (and should) send follow-up communications. 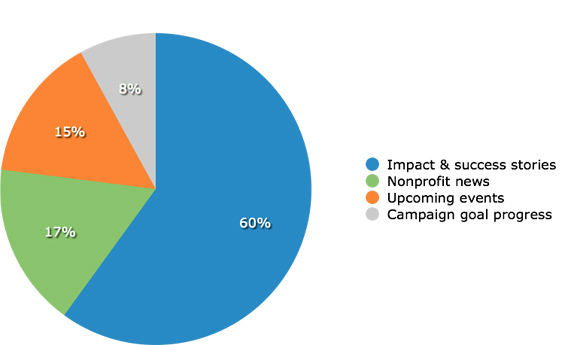 Software Advice asked respondents what kind of updates they like to receive from nonprofits they support. Success stories serve as proof that you are an effective organization. When a donor makes that first donation, it is as if they are allowing you to audition for their support. You will only get the role if you show you can make a difference, when given the opportunity. Therefore, you should always be on the lookout for compelling impact stories to feature in your follow-up communications. While success stories were the update of choice for 60% of those surveyed, the next most popular updates were the latest news from the nonprofit (17%) and upcoming events (15%). Other than success stories, a key part of following up is simply saying “thank you.” But these days, nonprofits have more and more options through which to convey their gratitude. Software Advice asked which type of contact people like to receive a thank you message. And the results may surprise you! The most popular choice was a personalized letter in the mail, preferred by 46%. That’s right. Almost half of respondents wanted their thank you by snail mail. 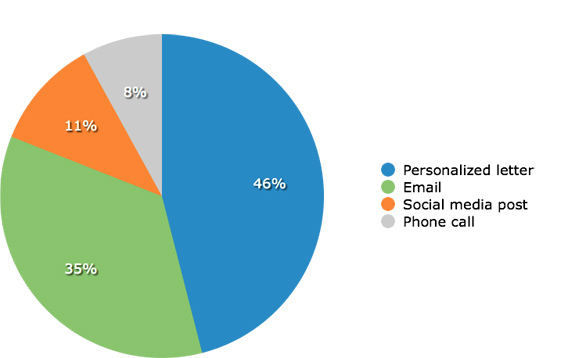 The next most popular options were email (35%) and a social media post (11%). A phone call, however, was preferred by only 8% of those surveyed. Another notable finding from Software Advice’s survey was that two-thirds of the respondents said receiving a gift after donating would not motivate them to donate again. So sending out tote bags and license plate covers probably won’t help much with donor retention. But nonprofits can also show their appreciation for a donor in the form of public recognition. Finally, to turn a one-time donor into a repeat donor, you have to ask them to give again. Software Advice asked people how long an organization should wait before asking for another donation. The majority of respondents said seven months or more, with 35% saying 7 to 12 months and 28% saying more than 12 months. Although 21% were comfortable with being asked after 3 to 6 months, only 16% wanted nonprofits to ask less than three months later. While you certainly shouldn’t wait to send a thank you, it seems that nonprofits might fare better by waiting at least seven months to make their second ask. The people surveyed were faced with another question on future asks: how many times should nonprofits ask for another donation? 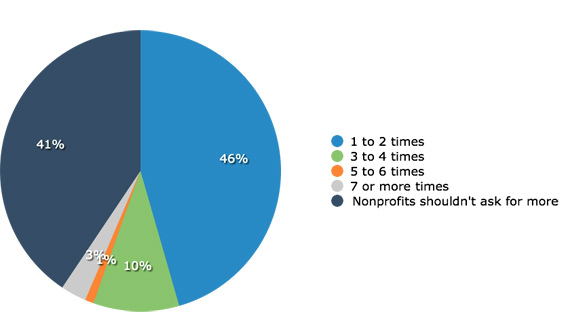 The bad news is that 41% said nonprofits shouldn’t ask for more at all. The most popular choice (46%) among respondents was that a nonprofit should ask one or two more times. 10% said they should ask 3 or 4 times, but only 4% preferred any more than that. “While asking previous donors to give again is a solid fundraising strategy that all nonprofits should use, most supporters don’t appreciate methods of asking that disrupt what they are doing, such as a telephone call. But most are very receptive to, and appreciate more passive ask methods, such as a personalized letter or postcard sent in the mail,” Finch added. Donors want to see impact stories showing what you have achieved. Include these stories when following up with donors. Almost half of those surveyed said they would prefer to be thanked with a personalized letter. Email was the second most popular medium for saying thank you. 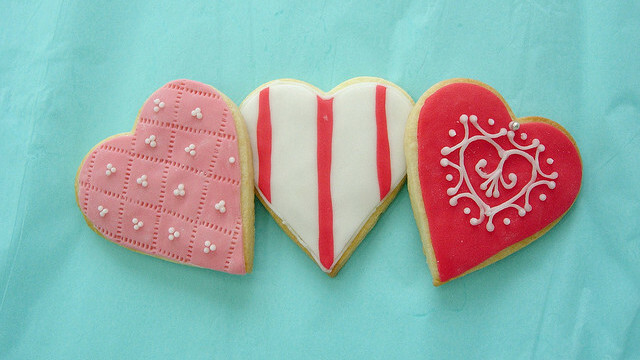 2/3 of donors say gifts from the organization do not motivate them to give again. Most of those surveyed want a nonprofit to wait at least 7 months before asking for another donation. In the meantime, follow up with donors by offering a sincere thank you and some powerful impact stories. The majority of those surveyed said a nonprofit should ask for a donation between 1 and 4 times. More than that will likely irritate donors.